The Bolingbrook Babbler: Mayor Claar: Hurricane Sandy is not an invading spaceship! Mayor Claar: Hurricane Sandy is not an invading spaceship! Bolingbrook Mayor Roger Claar assured the interstellar press corps that Hurricane Sandy is not a disguised UFO. The press conference was intended to highlight the smooth relocation of UFOs from New England UFO bases to Clow UFO Base. When asked about rumors that Hurricane Sandy was a disguised invasion craft, Claar became upset. 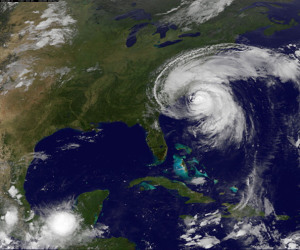 Claar also denied that HAARP is manipulating the hurricane, nor that the New World Order planned to use Sandy as a cover story for taking out the New England power grid. Claar also reassured the reporters that Sandy would have a minimum affect on Bolingbrook. He added that there was plenty of room and supplies for the extra alien visitors. Claar added that Sandy shows how Clow is important to Earth’s relationship with the aliens. Clow expects the increased traffic to start Sunday afternoon, and last until Monday evening. UFO spotters can expect more sightings from the East, with a slightly greater chance of daylight sightings. As usual, UFO spotters should never venture onto the grounds of Clow Airport or bother the employees. The airport employees most likely do not know about the UFO base.